The Utah Arts Festival offers plenty of earthbound pleasures, from musical performances to a markeplace teeming with visual artists. But for the daily headline performance at the Main Library, visitors find themselves unable to avoid staring skyward. 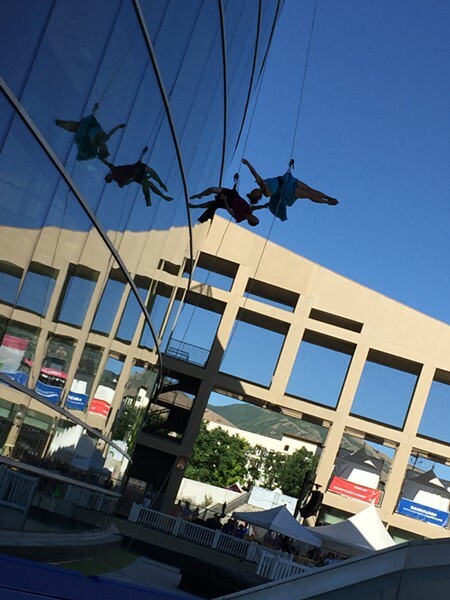 Oakland, Calif.-based Bandaloop, making a return visit to UAF after appearing in 2013, offers a daredevil spin on modern-dance choreography, as the six members of the troupe take turns performing pieces against the glass atrium wall of the library while suspended from ropes. 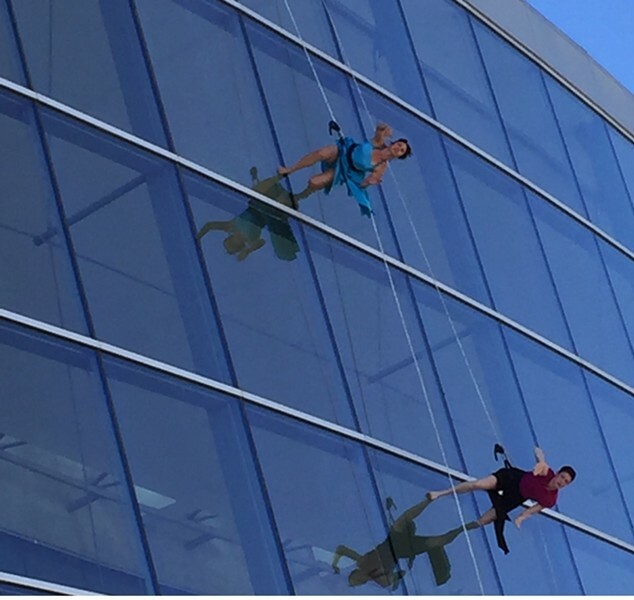 Alternately rappelling, leaping and spinning to the music, they give a new angle—approximately 90 degrees—to beautiful movement. While the dancers interact in various combinations through the three pieces that are part of the half-hour s how—including founder Amelia Rudolph's solo showpiece—they also interact with their unique "stage" in a site-specific way. From side angles, the mirrored surface doubles the dancers, creating an image of dancers synchronized not just with their human partners, but with themselves. And despite the vertiginous component to the show, the emphasis is never on some sense of circus-like imminent danger. It's a symphony of bodies in motion, just like any great dance piece. It just so happens that these bodies are in motion while suspended from a rooftop. Some of the sightlines are challenging from specific locations for the earlier of the two performances—at 5:30 p.m. and 7 p.m. daily—as you might find yourself staring towards the setting sun. Find a shaded spot at the library edge of the amphitheater on the east side of the wall, or face east from the opposite side. It's a breathtaking pause at the center of a festival where beauty can come at you from any direction.